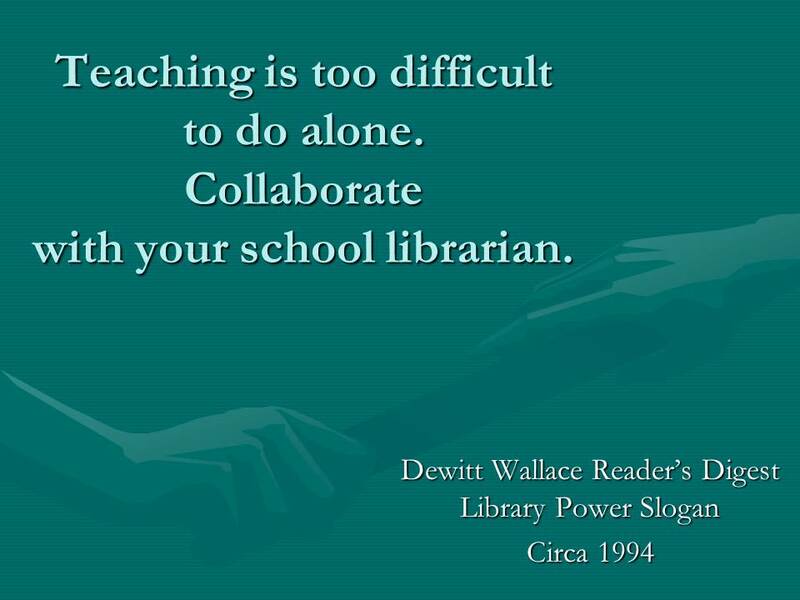 As my piece of the May 19th Building a Culture of Collaboration Webinar, I will share and invite you to share the many ways school librarians can collaborate to support powerful student learning in our schools. As a former school librarian at every instructional level, I have served in schools with as few as three hundred students and as many as eighteen hundred. Regardless, I always made relationships with students a top priority in my work in the place we called “our” library. Student library aides, drop-in students, before school, lunchtime, and after school “regulars” may respond to the library’s welcoming and inclusive atmosphere. Student clubs, formal or informal, may choose library spaces for their meetings. School librarians have the opportunity to reach out to the students who frequent the library to build caring and supportive relationships with them. Through coteaching with classroom teachers, we can show caring and support in other ways. We can advocate for real-world, relevant research and inquiry learning, for thoughtfully integrating technology tools and devices, for student choice in reading and topic selection. When we coplan, coimplement, and coassess student learning, we have a great deal to contribute to student success. 1. What would a member of your community who hadn’t been in a school library in years see when she/he walks through the door or happens upon your school library Web site? 2. Where is student input reflected in various learning and social spaces in the library or on the library Web site? 3. Where is student learning evidenced in the library? Are final projects on display or linked to the Web site? 4. Are students participating in reader’s advisory by contributing book talks and trailers that are on display or accessible to schoolmates via QR codes, the library catalog, or the Web? Bring your self-assessment to the Webinar on May 19th. Learn what others may be doing to build a culture of collaboration in their schools through their work with students. Remix image from Thurston, Baratunde. “I Am A Community Organizer.” 7 Sept. 2008. Flickr. 29 Apr. 2015. <https://www.flickr.com/photos/baratunde/2837373493/>. This month the BACC co-bloggers are previewing our upcoming (May 19th) Texas Library Association Webinar. See the end of this post for information. 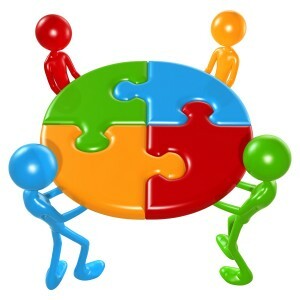 Along with our guest blogger, Melissa Johnston, each of us will be previewing our piece of the collaboration puzzle in our May blog posts. BACC co-blogger Karla Collins will offer the final contribution this month with a post-Webinar wrap-up. When we are engaged in building a culture of collaboration in our school learning communities, we determine the best ways to meet the needs of each of our library stakeholders. Through communication and collaboration and to use a construction metaphor, we build relationships that can help cement the foundation of a culture of learners—young and older—who strive to make school a joyful, relevant, and effective learning environment for all. On Thursday, I will introduce collaboration with students as one of the pillars necessary for building a culture of collaboration. How can you increase collaboration in your school learning community? Building a Culture of Collaboration at Edublogs co-bloggers will share strategies for reaching out and developing collaborative relationships with four library stakeholder groups: administrators (Judy Kaplan), classroom teachers and specialists (Melissa Johnston), students (Judi Moreillon), and families and community members (Lucy Santos Green). Bring your commitment to building partnerships, your experiences, your ideas and your questions to the conversation. Gladwell, Malcolm. The Tipping Point: How Little Things Make a Difference. New York: Little, Brown, 2000. Print. Maxwell, Scott. “Working Together Teamwork Puzzle Concept.” 2007. Flickr.com. Web. 25 April 2015 <https://www.flickr.com/photos/lumaxart/2137737248/>. Inquiry is encouraged and no question is “dumb.” It’s a space for collaborating, doing, and connecting physically and virtually. It’s local and global. It belongs to its users. They can tell the story in so many effective ways. Teacher librarians are master facilitators, spinning the plates. We have to nurture our storytellers, and give them opportunities to shine a light on their learning through blogs, websites, videos, newsletters, interviews, podcasts, spotlights on projects and process, awesome reading and writing. They can deliver an authentic message that has power beyond our words. We just have to provide the venues. Once we begin to think of advocacy as a total immersion activity, and not a once a year special event, we can begin to focus on the sustained impact of school libraries and programs in an educational community. If we think about advocacy as collecting the stories, (and not so much about “data/evidence,” even though that is the essence of it), we flip the narrative. Sharing the stories through a social media platform, such as Twitter, Facebook, Flickr, or a blog, can be a snapshot into the school library world. Keep a camera handy, and set aside a few minutes to upload and highlight the joys of learning that happen from week to week. Involve the students and teachers, and give them a chance to tell the stories. April is School Library Month. In Virginia, the governor makes an official proclamation every year acknowledging the importance of school librarians. The proclamation talks about the educational impact made by school librarians and the role of our profession in educating the students in the 21st Century. School librarians around the country spend this month advocating for their programs and espousing the significance of school libraries to the entire school. Who are the best advocates for the importance of school libraries? The students we serve. Truth – school librarians are important in developing 21st century learners. 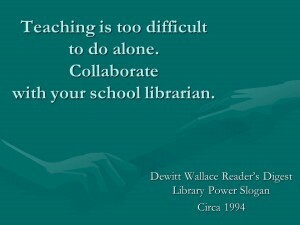 Truth – school librarians play a pivotal role in the school. Truth – school libraries should be the heart of the school. Truth – school libraries MUST be places of comfort and refuge for ALL of our students. When I was a high school librarian, a student leadership group at the school conducted a survey about bullying. We were delighted when they analyzed the results and discovered that the “safest” place in the school was the library! Students commented, “No one would dare bully anyone in the library. Everyone is welcome there!” Our students became our best advocates. They posted signs declaring the library was the safest spot in the school and announced it on the daily announcements. Their library was their safe haven no matter who you were, and they wanted everyone to know it. They wanted all students in the school to know that the library was a place of refuge, where all students mattered. What would your students say about your library? 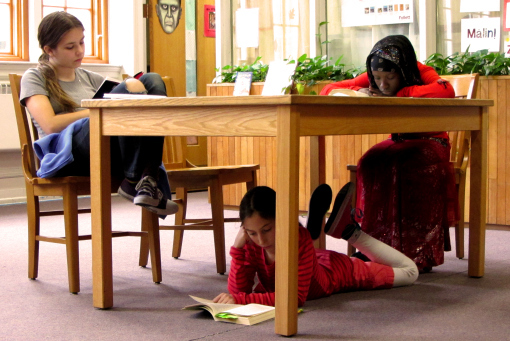 Put it to the test and ask them: Why does the school library matter? Share your video and let your students be your best advocates! I’m a dog person. I love to watch our dogs on a sunny day as they follow the sun spot streaming through the window. 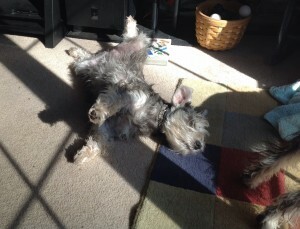 They can’t get enough and they get up and move as the sun moves. They are content, relaxed, and in their happy place. The library should be the sun spot for our students. It should be the place they go when they need comfort. It should be the place they seek out for warmth and belonging because they matter, and so does the library – their sanctuary – their place of escape – their home. It’s where their heart is. Advocacy is one of those terms we throw around in school librarianship, assuming everyone in the room knows exactly what we are talking about. Most of us can probably point to examples: promotional videos, events and programs such as School Library Month, Family Fun Night, Read Day etc. However, it can be easy to confuse advocacy with marketing. While the examples I just listed are extremely important, I believe these are only a slice of advocacy – not the entire cake. Advocacy is typically defined as the act of speaking or writing in support of someone or something. MW defines it as “the act or process of supporting a cause.” I like the use of the word “process“. To me, this word reminds us that advocacy is comprised of daily actions, communication, instructional decisions, relationships nurtured, even budgetary choices. Advocacy is a daily attitude. Re-read those statements and replace the words music program with school library program. Aren’t the efforts the same? The purpose equal? Are we not advocating for a quality “school library education for every child”? I encourage you to read through the rest of NAfME’s advocacy statement – it lists concrete examples of advocacy that foster a daily attitude of support and program promotion (including good ideas for dealing with potential program cuts). Of course, AASL and ALA have wonderful advocacy kits and resources, as well as a treasure trove of articles and columns on the subject. However, I find that exploring issues from a different profession’s perspective sometimes helps to clarify our own, introducing us to a new way of considering our existing challenges. I also encourage you to think through your daily professional practice in light of that list. What are ways that you can advocate for your program locally, throughout the day? Do you make a point of sharing curated resources with teachers, parents and administrators? Do you actively pursue relationships with parents, administrators, board members, and the community, always sharing how the school library academically benefits students? 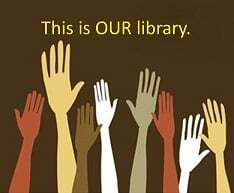 Is your school library an open and welcoming place? Do teachers perceive you to be open and supportive of their classroom goals? As you celebrate School Library Month, remember that the process of advocacy is a daily one. Green, L. (2014). School librarians and music educators: A concert for student success. Library Media Connection, 33(3), 20-23.